Wednesday December 19th 1877. I finished the ironing this morning and sewed some on Miss Cattrells apron. I finished it soon after dinner and then went down to Mrs McGoverns awhile and over to Folsoms to invite them over Saturday to visit. I practiced one hour in the afternoon and one in the evening. I knit a little too. 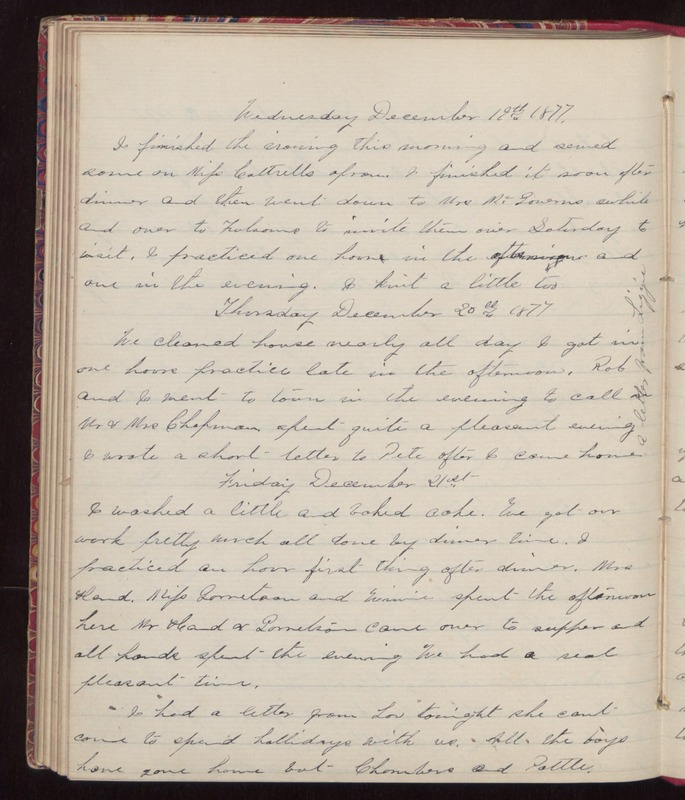 Thursday December 20th 1877 We cleaned house nearly all day I got in one hour practice late in the afternoon. Rob and I went to town in the evening to call on Mr & Mrs Chapman, spent quite a pleasant evening I wrote a short letter to Pete after I came home. A letter from Lizzie. Friday December 21st I worked a little and baked cake. We got our work pretty much all done by dinner time. I practiced an hour first thing after dinner. Mrs Hand, Miss Garretson and Winnie spent the afternoon here Mr Hand & Garretson came over to supper and all hands spent the evening We had a real pleasant time. I had a letter from Lou tonight she cannot come to spend hollidays with us. All the boys have gone home but Chambers and Pottle.